The graph above does not show 12/8/11 because App Store updates often take 24 hours to process and are staggered. Since Geometry Stash’s last update in June, ~1600 copies of Geometry Stash have been bought. This estimate does not take into account discounted educational institution purchases. 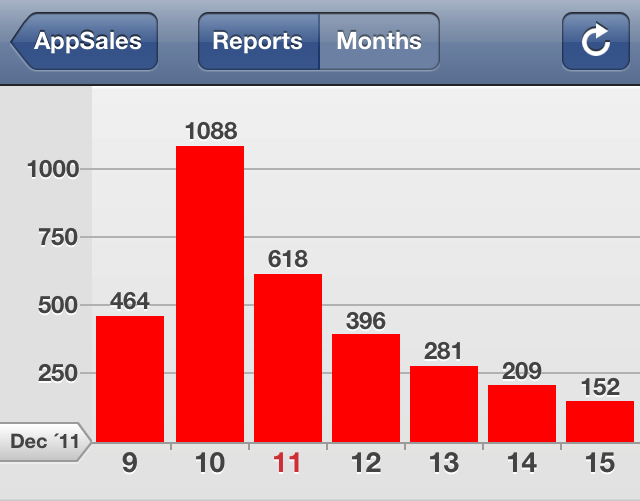 Since iTunes Connect does not save sales reports over 13 weeks and the past sales reports have been lost when the iOS 5 beta build expired, these numbers are only rough estimates, ±500 copies. Obviously We cannot have a 200% retention rate and most users do not own two iOS devices.Then ~1600, 50% of the updates, must be from before the last update on 6/9/11. Geometry Stash’s sales have remained predictable throughout the last two years. So since the app’s price was changed to $1.99, up from $0.99, about 1.5 years ago, ~4800 copies have been bought (also reflected in revenue received). With these new numbers in mind, we have a ~62.5% retention rate since Geometry Stash’s price was set to $1.99. 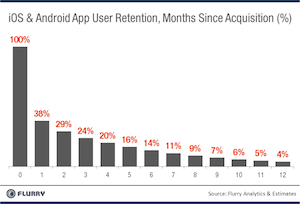 Not bad considering Flurry Analytics has posted an average 4% retention rate after 12 months in their Traffic Aquisition post, though their stats do not compensate for paid vs free apps.